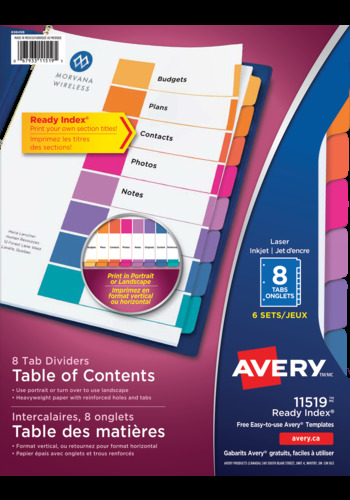 Divide and conquer manuals and reports with colourful dividers for a professional and organized binder. Ready Index Dividers make it quick and easy to locate important information. They include a pre-printed and numbered Table of Contents page along with eight plain multi-coloured divider tab. Constructed with heavy weight paper and reinforced tabs, they provide extra durability and can stand up to prolonged use in binders. You can customize the table of contents page using the Avery® Design & Print Online Software, to add section titles, graphics, or your company logo, then print with your laser or inkjet printer in no time. Ready Index Dividers feature stronger tab reinforcements and double-sided hole reinforcements to prevent tearing. The Table of Contents page and tabs are made from heavy weight paper for added durability. Use in either portrait or landscape formats to suit your presentation. Ready Index Dividers are the dependable way to create organized binders and customized reports conveniently from your computer.